Chinese New Year in Honolulu Chinatown is a Blast. Chinese New Year is a Blast! 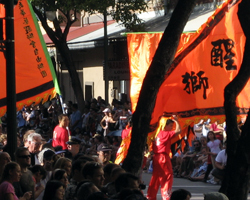 Why might you be interested in the Honolulu Chinatown annual Chinese New Year celebrations? Well… besides the fact that they have fireworks – which are always a blast – these Hawaii festivals are both fun and free. Furthermore, they’re a great opportunity to discover and experience one of our diverse Hawaii cultures. The first Chinese to arrive in Hawaii were among Captain Cook’s crew in 1778; but the bulk of Chinese immigration occurred in the second half of the nineteenth century when laborers were needed for the sugar plantations. The old cane fields are largely planted with housing developments now, but the descendants of those early Chinese settlers remain an important cultural contributor to our local way of life. For that reason – and because we love to celebrate any and all Hawaii special events – Chinese New Year is a fairly big deal here in Honolulu. In case you aren’t already aware of this fact: the first thing you need to know about Chinese New Year is that it’s determined by a lunar calendar, which means it falls between mid-January and mid-February (see chart at right for upcoming dates). Needless to say, that makes it difficult to give you information that won’t change from year to year. Nevertheless, the various Honolulu Chinatown celebrations usually span a few weeks, so your chances of finding Chinese culture related Hawaii activities during your vacation to Hawaii are fairly good. Narcissus Queen Pageant (open to the public, but not free). This event is said to be the oldest ethnic pageant of its kind in the United States. The queen is chosen based on an interview with the judges, talent, evening gown appearance, and speech. There is no swimwear portion. Chinese New Year Festival (free to the public). This Hawaii festival is usually held on two weekends, Friday and Saturday from approximately 10am to 10pm at the Chinatown Cultural Plaza Center (100 N. Beretania Street, Honolulu, HI 96817); and it features food vendors, craft booths, and entertainment. 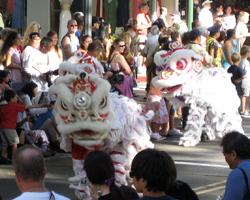 Narcissus Festival and Lion Dances (free to the public). 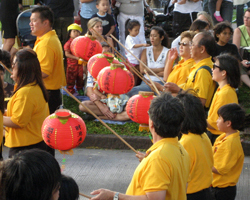 This Hawaii festival usually falls on a Friday evening from approximately 5pm to 10pm; and it starts in the area around corner of North King Street and Nuuanu Avenue in Honolulu. The event kicks-off with a traditional lion dance. Then the Narcissus Queen and her court visit various Chinatown businesses. Night in Chinatown Street Festival (free to the public). 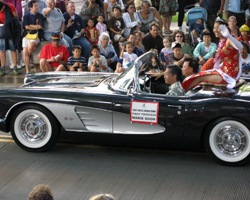 Held on a Saturday from approximately 10am to 10pm in the area of Maunakea and Smith Streets in Honolulu. At approximately 3pm, there’s a parade of lion dancers, dragon dancers, Narcissus contestants, and more along Hotel Street between Richards and River Streets. I wish I could tell you exactly which dates will apply to each of these Hawaii special events, but it’s just impossible to predict. Even more unfortunate... I used to be able to link you to the official Chinatown Event Calendar, but that site seems to have gone away. I'm looking for another suitable resource, but haven't yet found it. Sorry. In the meantime, if you're enjoying a Hawaii vacation in January/February, ask your hotel concierge if there are Chinese New Year events scheduled during your stay and/or check the local news for updates. One last thought… you might want take TheBus to get there. Most routes run right through this part of Honolulu (or very nearby), and this will save you the hassle of looking for parking. But if you do need to drive, there are several paid parking garages in the area. There is very little metered street parking.